November 27, 2017 by C.S. Clarke, Ph.D. 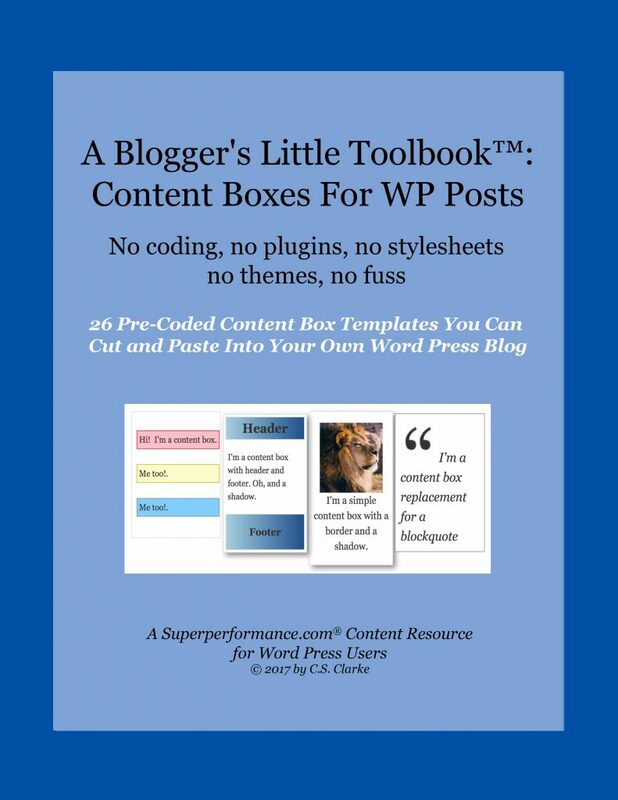 This particular series, A Blogger’s Little Toolbook™, is obviously for bloggers. The first volume offers reusable cut and paste content box templates. I plan to do more books in this series, with a variety of content types. And I plan to do more than one content resources book series. But wait! What’s a content resources book? A content resources book provides reusable content such as clip art, advertising swipe files, quotations, “how to say it” phrases and paragraphs, illustrations, layouts, music, story plots, non-fiction outlines, templates for both design and writing, and just about any other elements that you can imagine being useful in creating your own publications. One good example of reusable artistic content is the Dover series of books. restrictions or may be free to use in any way you like, simply for the price of the book. Some content books may include instructions on how to use the content. Others may simply provide the content. I’ve long planned to make content resources books. Finally, I’ve got one done. It’s much shorter than I planned originally. I was going to make a greater number of templates available as an add-on to a blog post I made. You see, as a kind of proof of concept, not long ago I made a long blog post of 26 templates for creating content boxes in individual WP posts. If you’ve got the right theme or plugin, you can do this easily with WP pages, but it’s really difficult with just one post. Unless you can code it yourself. And have the right WP editor. So, I created pre-coded templates for such content boxes as well as simple instructions on how to use them. It was just cut and paste. The post I made was entirely written in the code. To prove that it worked. None of the images of content boxes were actually images. They were just code. All the user had to do was cut the code written on the post and paste it into a WP editor. I’ve removed the post because I’ve used it to create a book. And a free pdf version to go with it that makes it possible to cut and paste without having to scan the book or type it in. I have colleagues who suggested that since it’s difficult to get pre-coded content boxes (except included in a theme) for love or money, I should stop messing around and start publishing with the ones I already had. I know they’re right. The reason I wrote my own is that I couldn’t just buy some already made. So I followed the advice. November 27, 2017 March 26, 2017 by C.S. Clarke, Ph.D. Content boxes give you the flexibility to make each post different in design. 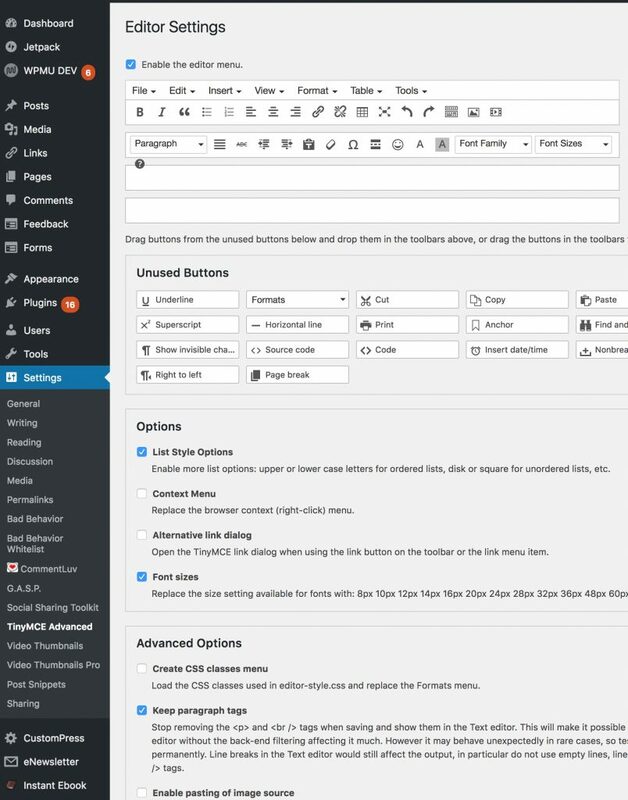 With content boxes added on a post-by-post basis, you can have a variety of styles without complex themes or plugins. You can simply add some “copy-and-paste” lines of code to the text editor of the WordPress and use the resulting template in the visual editor. All of the content boxes here are responsive and should adapt to any size post column in your blog. That said, it is best to read this article and apply the resources on a desktop or laptop computer. Even though the content boxes can be used easily and effectively on most mobile devices, you will best understand them and this article by first seeing them in full size and resolution. As I mentioned in an earlier update to this blog, I like to vary the formatting of my posts. I don’t have lots of time to code. So, I’ve tried a number of plugins meant to help with the kind of formatting I want. Many were supposed to help replace the formats for asides, image presentation, quotes, links and status updates that WordPress used to make available in its core. And WP still makes gallery formatting available through the “add media” button in the editor. But, I’m not satisfied with the plugins or the gallery function provided by WP. Also, plugins take time to learn how to use. (Did I mention I don’t have lots of extra time?) And then there’s the expense — the ones you prefer may turn out to be the pricey ones, rather than the free ones. So, I’ve gone back to coding my own. It’s actually faster. Just a few lines of html styled with css can do a lot. Furthermore, as I mentioned in the content box above, the code I’m going to share with you is designed to work in responsive themes. The css is inline rather than relying on stylesheets, so it should work fine in any theme and won’t change with updates to themes or WP. This article is a demo and how-to for you. It’s a bit long. Yet, all you will have to do is copy a bit of text, select the “text” tab in your WP editor, paste it in, hit the “visual” tab and you’re good to go. However, there is one change you may have to make. The editor that comes with WordPress is called “TinyMCE.” It’s a very good basic editor. But its visual editor strips some html that it considers superfluous from the modifications (like content boxes) that you make in the “text” editor. So, in order to make the content boxes look and work correctly, you’ll have to get “TinyMCE Advanced,” if you don’t already have it. And you will have to use the settings tool to prevent that stripping. Here’s how to get TinyMCE Advanced. First, go to https://wordpress.org/plugins/tinymce-advanced/ , install it by whatever method you usually use with your WP and activate it. If you do not know how to install plugins or themes, you need to learn that before you try adding content boxes to your posts. You can do that at http://www.wpbeginner.com/beginners-guide/step-by-step-guide-to-install-a-wordpress-plugin-for-beginners/. I’m assuming that anyone interested in making their posts look more stylish has the basic skills of using WP. As I illustrate in the image below, select “settings” from your sidebar and choose “TinyMCE Advanced.” Your screen should look much like the image. Find “Advanced Options” and check the box “Keep paragraph tags.” Be sure to hit the “Save Changes” button before you exit the page. I leave it to you to find out all the other lovely things you can do with TinyMCE Advanced, but I will say you’ll be pleased with how much more powerful your editor has become. Of course, if you already do have TinyMCE Advanced, all you need to do is make sure the “Keep paragraph tags” box is checked. The article is long because it gives you a whole bunch of content box designs. There’s not a lot of stuff to read — it’s primarily samples of the content boxes themselves and code snippets to copy and paste. Let me start a quick demo with content box examples and code first. In the next section, after the boxes and code, you’ll find illustrated instructions for putting them in your posts. Below are some very simple centered 50% sized content boxes with white or subtly colored backgrounds. The code for each box appears directly below that box. White centered 50% content box. Very light gray border. Select and erase the text in this box and and replace it with your image and/or text. Click your cursor immediately above or below this box to type or place other content outside this box. Very light gray centered 50% content box. Very light gray border. Select and erase the text in this box and and replace it with your image and/or text. Click your cursor immediately above or below this box to type or place other content outside this box. Very light blue centered 50% content box. Very light gray border. Select and erase the text in this box and and replace it with your image and/or text. Click your cursor immediately above or below this box to type or place other content outside this box. Very light pink centered 50% content box. Very light gray border. Select and erase the text in this box and and replace it with your image and/or text. Click your cursor immediately above or below this box to type or place other content outside this box. Very light green centered 50% content box. Very light gray border. Select and erase the text in this box and and replace it with your image and/or text. Click your cursor immediately above or below this box to type or place other content outside this box. Here are the same content boxes as immediately above, but with an attention-getting thickly-stroked left border. White centered 50% content box. Very light gray border. Gray left stroke. Select and erase the text in this box and and replace it with your image and/or text. Click your cursor immediately above or below this box to type or place other content outside this box. Very light gray centered 50% content box. Very light gray border. Gray left stroke. Select and erase the text in this box and and replace it with your image and/or text. Click your cursor immediately above or below this box to type or place other content outside this box. Very light blue centered 50% content box. Very light gray border. Blue left stroke. Select and erase the text in this box and and replace it with your image and/or text. Click your cursor immediately above or below this box to type or place other content outside this box. Light pink centered 50% content box. Very light gray border. Red left stroke. Select and erase the text in this box and and replace it with your image and/or text. Click your cursor immediately above or below this box to type or place other content outside this box. Very light green centered 50% content box. Very light gray border. Green left stroke. Select and erase the text in this box and and replace it with your image and/or text. Click your cursor immediately above or below this box to type or place other content outside this box. 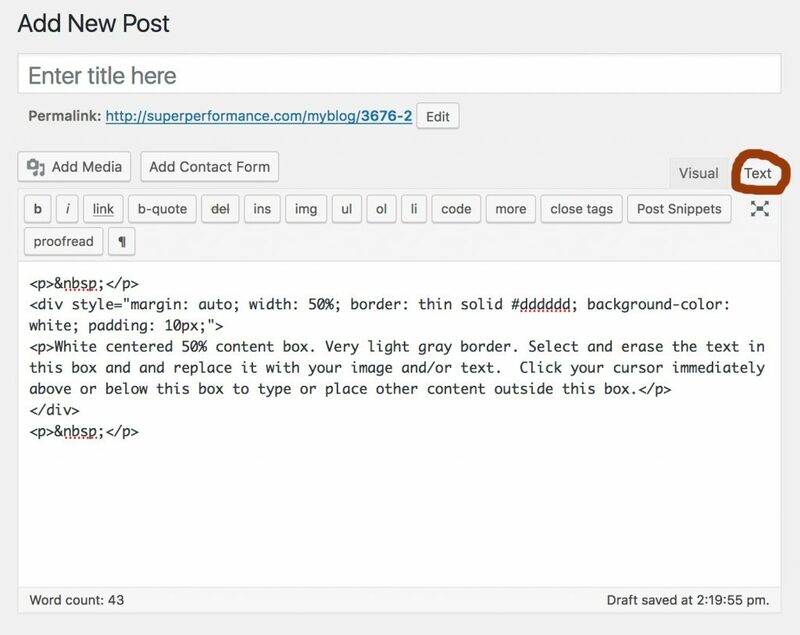 Now, here’s how to get the code into your WP post editor. 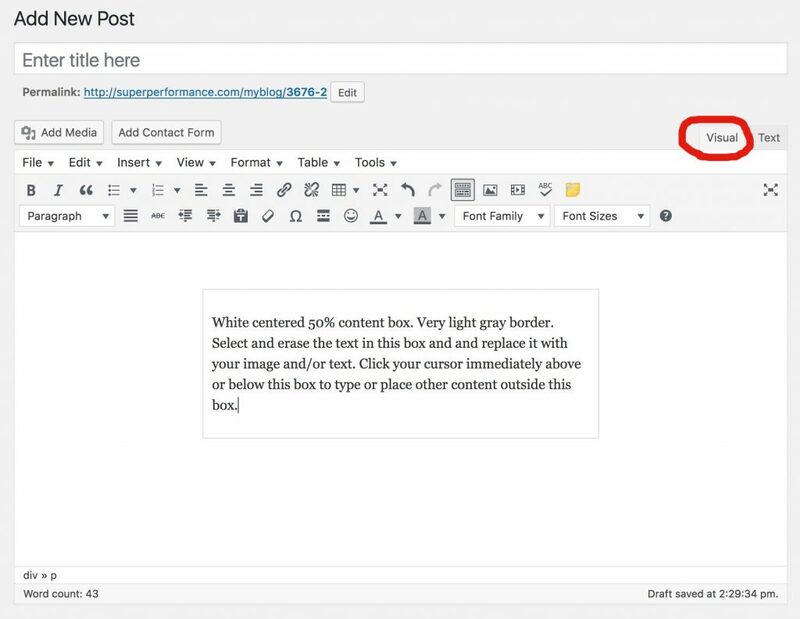 Open your WP post editor and select the “text tab.” Click inside the editor window and paste the text. Select the “visual” tab to return to your usual visual editor, and voila! — there is the box waiting for you to edit the text. 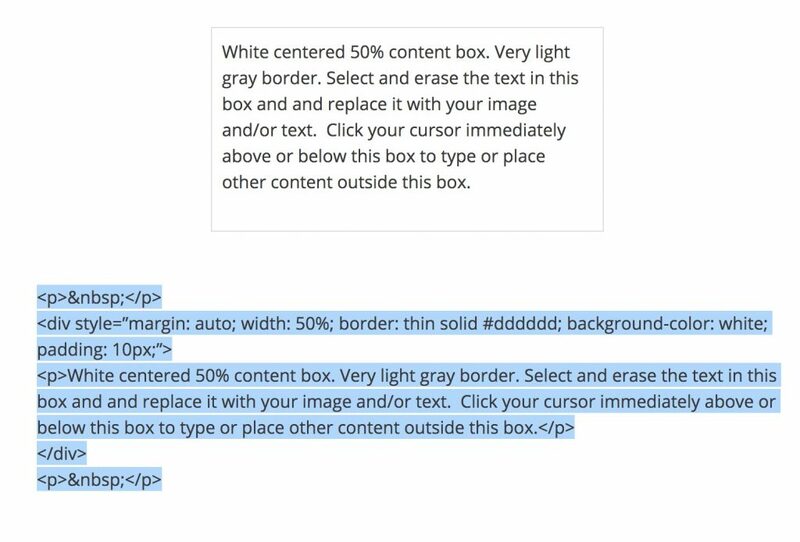 The further instructions for using the content box are actually written as content in the box itself. Next, let’s look at some content boxes that take the entire width of your post area. February 13, 2017 February 10, 2017 by C.S. 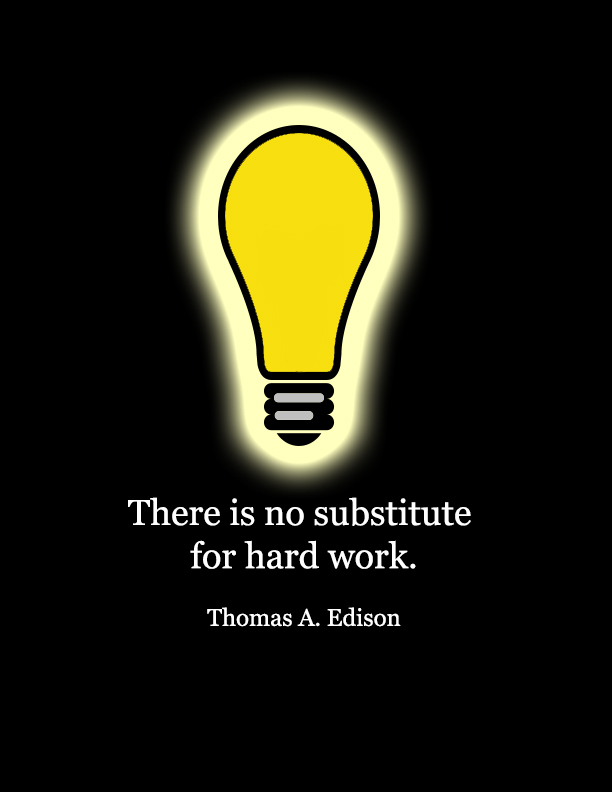 Clarke, Ph.D.
Well, Thomas Edison would know about hard work! Thomas Edison has been misquoted as saying he tried 5,000 times to create the light bulb before succeeding. Sometimes the number has been reported as 10,000. But there is no evidence of him ever saying such a thing. Regardless of exactly how many experiments his lab did, it’s evident there were quite a lot. So, my favorite quotation attributed to Edison is the simple one in the poster above. Unfortunately, I can’t find any evidence he said that either! But I can find plenty of evidence that work is essential to success. How about you?